Outlet Shopping with Quality Brands... Massive Savings! Enjoy huge savings on a wide range of ladies’ fashion, including clothing, jewellery, lingerie, nightwear, footwear, and accessories, all under one roof! Explore our range of affordable menswear from many popular quality brands. From casual clothing to formal wear, find your perfect outfit with us. Pavers are the first and last word in comfortable footwear. Walk away with a smile on your face and something stylish on your feet. Luxury bedding designed in the UK by Julian Charles, you can sleep easy in the knowledge that you’re buying from a premium brand. CONTACT us to speak to a member of the team at our discount shopping outlet in Dover, Kent. At De Bradelei Wharf, we offer discount shopping on quality brands in ladieswear, menswear, footwear, bedding, and gifts, all under one roof. There’s something for everyone here, and our customers love the relaxed experience we provide at our shopping outlet on the waterfront in Dover, Kent. We’re always eager to improve our range of brands and products, offering popular concessions such as Skopes, Pavers Shoes, and Tog 24. De Bradelei Wharf was established in 2002 and, since 2016, is a branch of J B Armstrong & Co Ltd, who also trade in Nottingham, Long Eaton, Shepshed, Belper, and Ilkeston. Shop until you drop into the Boardwalk Café, a cosy coffee shop offering great quality premium Italian coffee, tea, paninis, pastries, and fantastic snacks to shoppers. This comfortable environment also offers a children’s play area, to keep the kids entertained while you enjoy your coffee. 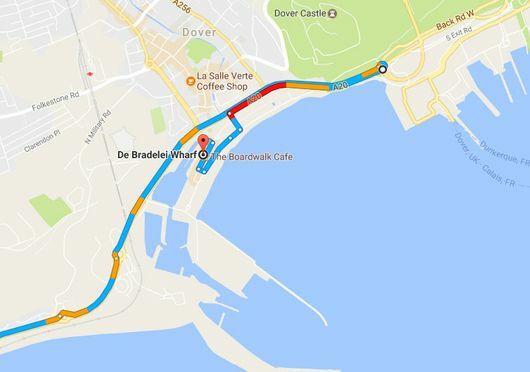 From the A20, drive to the Ferry Port roundabout and take the final exit to return to the A20, heading back to Folkestone, before turning onto Dover seafront. 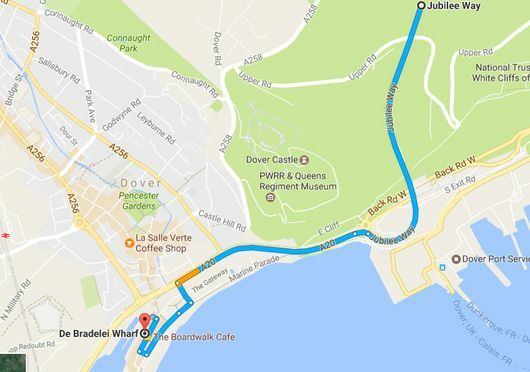 Drive down Jubilee Way to the Ferry Port roundabout and take the first exit, before turning onto Dover seafront. “Since taking over the business we have been working hard to increase our brands, there’s something for most ages here and many items cannot be bought anywhere else… with the regeneration taking place in Dover, the whole shopping experience will just get better in the future”.